This bar I bought for three weeks. A late bavarian MVK, war-metal with iron swords, made by Deschler. The EK is marked "G" for Godet. A honorable bar for a brave soldier. I like this kind of bars very much. 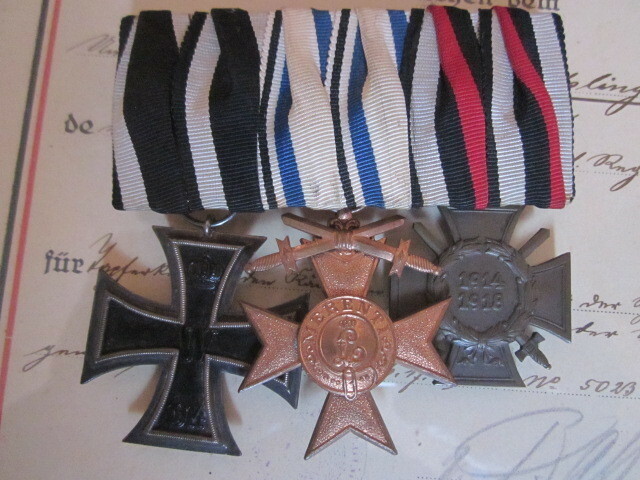 and a Franco/Prussian/1866 veterans bar @ 1900. Note the unusual Centennial medal. the 1871-medal is made of steel. It was for a non-combattant. the second bar, is a bar of an Unteroffizier (NCO) with 9 years service Medal. The first bar is a little bit difficult to classify. The most awards are prussian, only the MVK is bavarian. 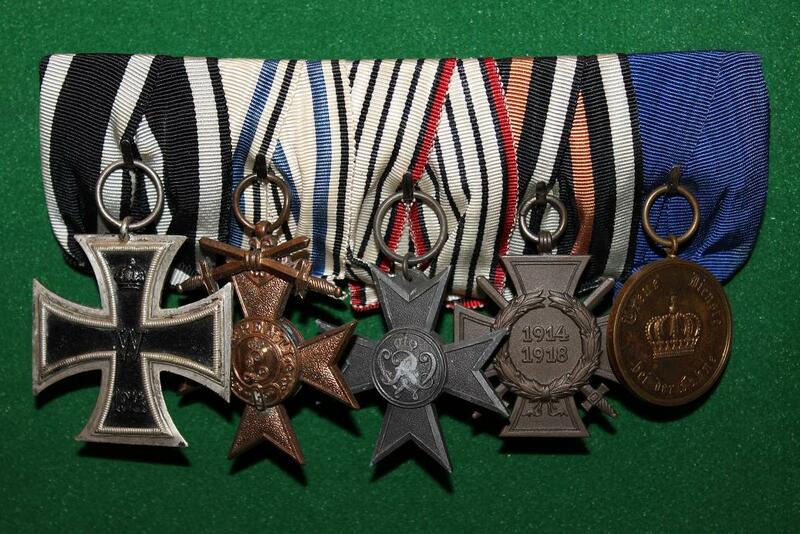 The Kriegshilfekreuz in the middle is for non-combattants, the EK and the MVK for combattants. Possibly he was at the beginning of WW1 in the garrison and become later a combattant. PS: the MVK with X is a Deschler, the MVK with crownX is a Hemmerle. Here a nice bar of a Landwehroffizier. 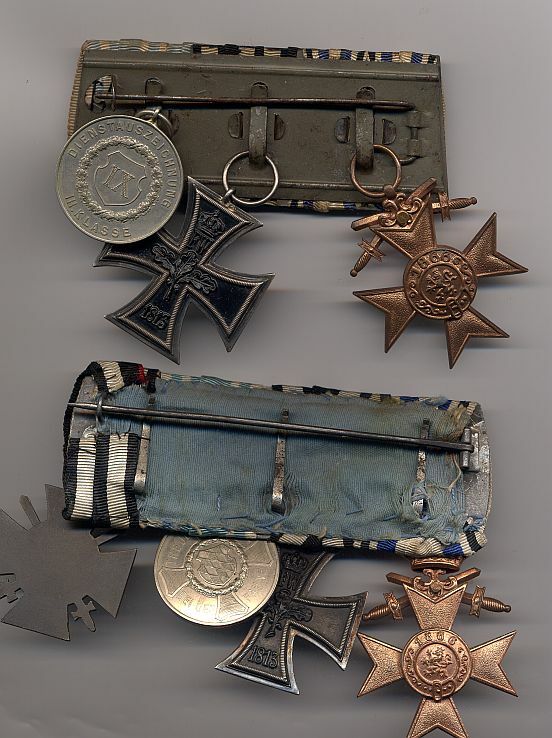 König-Ludwig-Kreuz and servicemedal first class bavarian Landwehr ( 20 years). 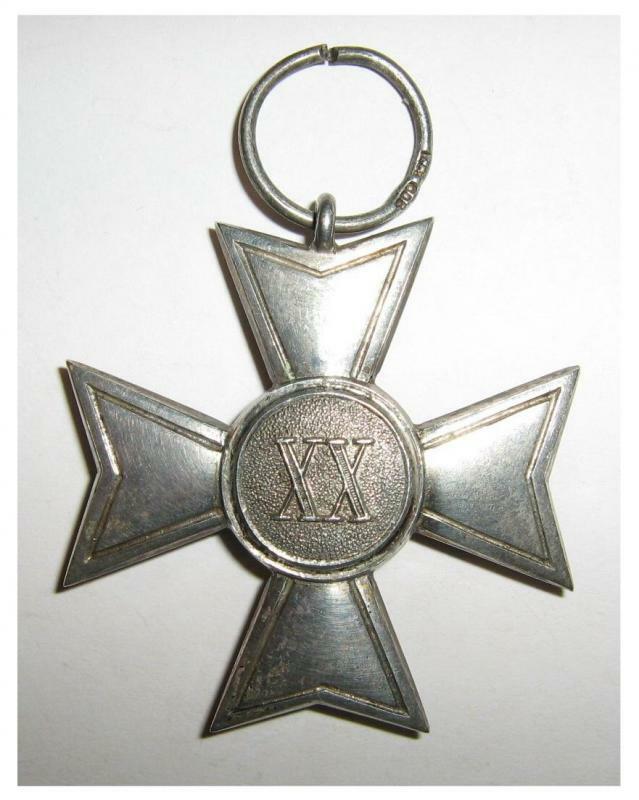 The Landwehr-servicemedal was returnable, so it is a rare decoration made of silver. This officer was a non-combattant. I really nice this bar. It has a very nice look to it. 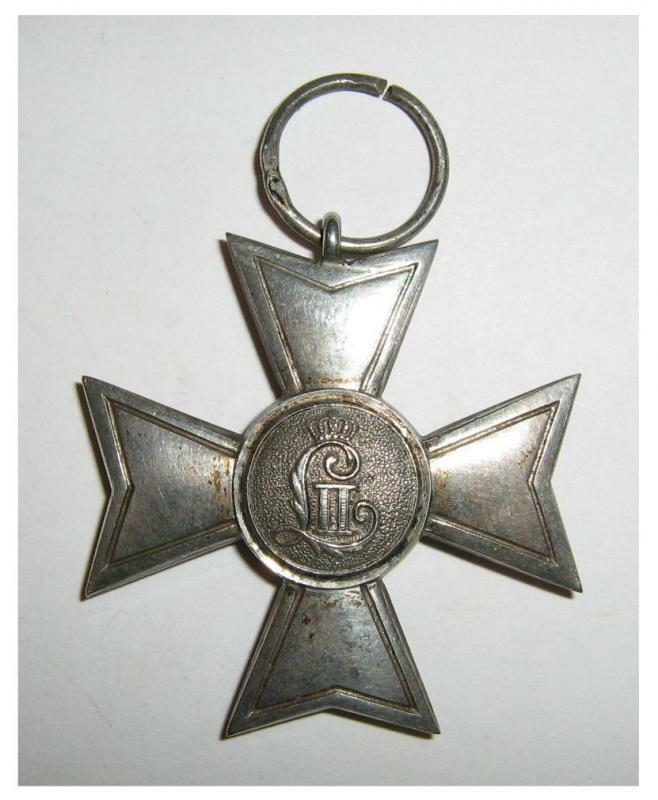 I've always liked the King Ludwig Cross. 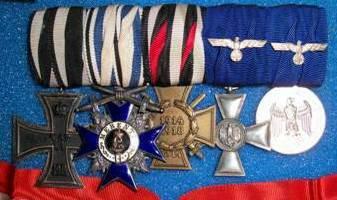 I must say the Landwehr Service medal is extremely nice. I've never seen one. the Landwehr service medal first class for 20 years was awarded to Landwehr officers. The medal is relatively rare because it was returnable. a very nice bar, made for civillian clothes ( in german Frackspange). 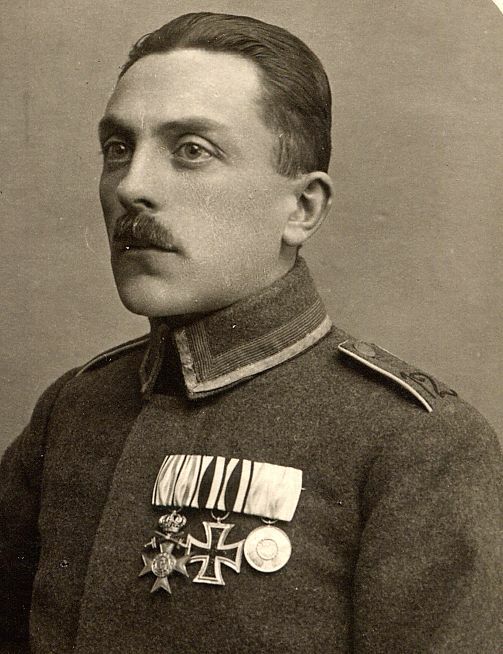 It should have been a Hauptmann (captain) of the bavarian Landwehr. The bavarian Landwehr Dienstauszeichnung is really a very nice piece! First time I see this medal!! the " Landwehr Dienstauszeichnung 1. Klasse" is a very nice dekoration. It is made of silver. There are some variants, because this decoration was awarded over 40 years. It was foundet in the 1870th. 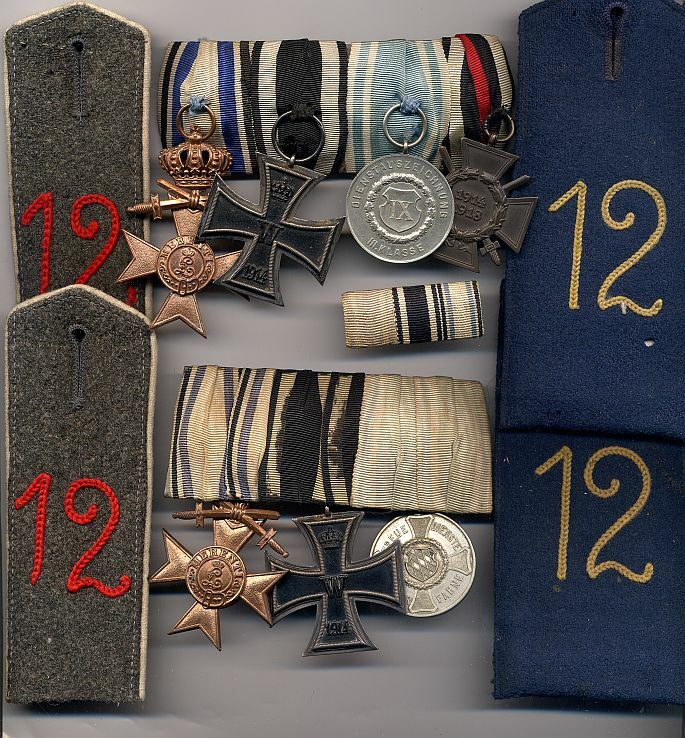 One-piece variants and crosses with seperat medaillons. I know the producer Weiss&Co, Quellhorst and Hemmerle. Thanks a lot, the details about the MVK are very interesting...I suppose they are in some diferent degree??? 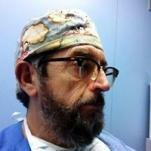 in wartime ther were five official producers of the MVK and three producers of the MVO. Hemmerle, Leser und Weiss produces both kinds. Lauer and Deschler produced only third and second class of MVK's. The individual levels of MVK were dependent on the rank of the mortgaged soldiers. First Class crown swords, Warrant Officers, mid-level officials in the Ministry of War. very nice bar's from the 12th bavarian infantery regiment "Prinz Arnulf". Possibly, the bars are from the same owner. 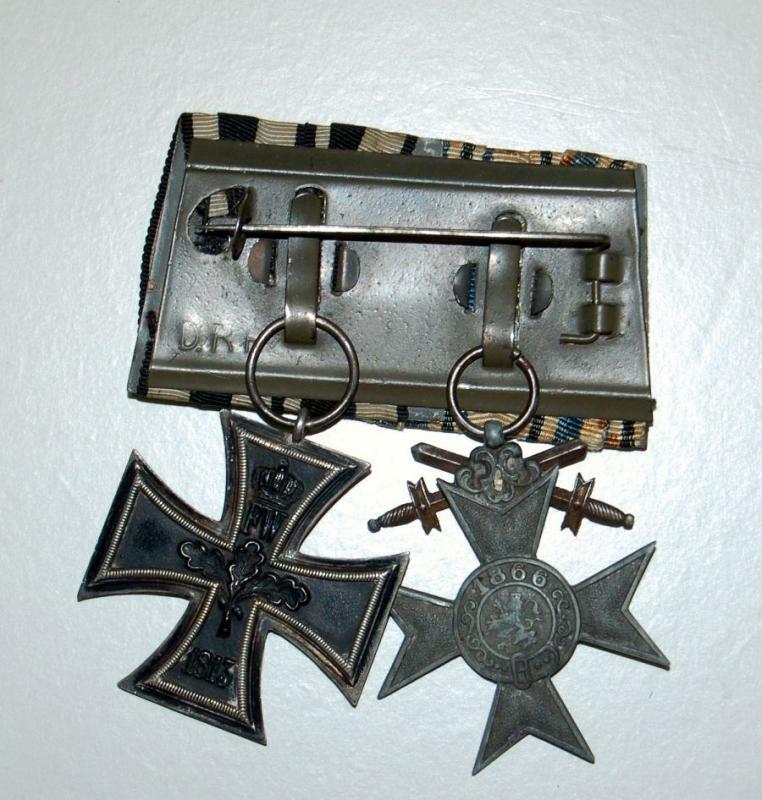 The bar with three decorations worn in the wartime. The four-decoration bar was sewed after 1934. Can you show us the backside? now I believe, that the bars are from two soldiers. The bar with four decorations were propably reworked by his owner. 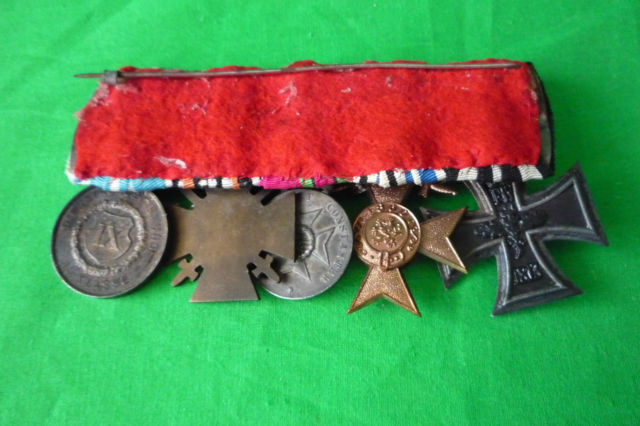 Please show me the back of the servicemedal from the 4 bar in a bigger picture. Is there on the rim a embossed error? where would I find the error? there is one post war variation from the manufacturer Lauer. He wrote his name below the rim. I want to know if it is the name or an embossed error. Look here is a possible for the Lauer marking. 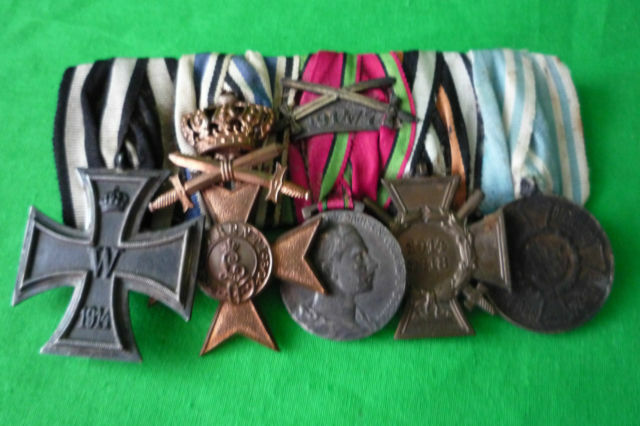 Hi here is one from my collection at first sight a modest little 3 medal bar of a Bavarian unteroffizier. EK2 maker marked WS on the small ring fixed to the medal. MVK3 with swords unmarked Deschler I think. Its not until you see the certificates that came with this bar that this bar comes to life. 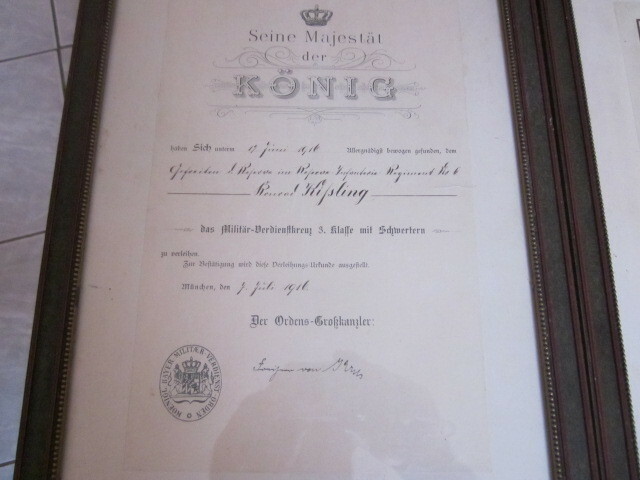 This bar belonged to Konrad Kissling of the 9th Company of the Bavarian 6th Reserve Regiment. 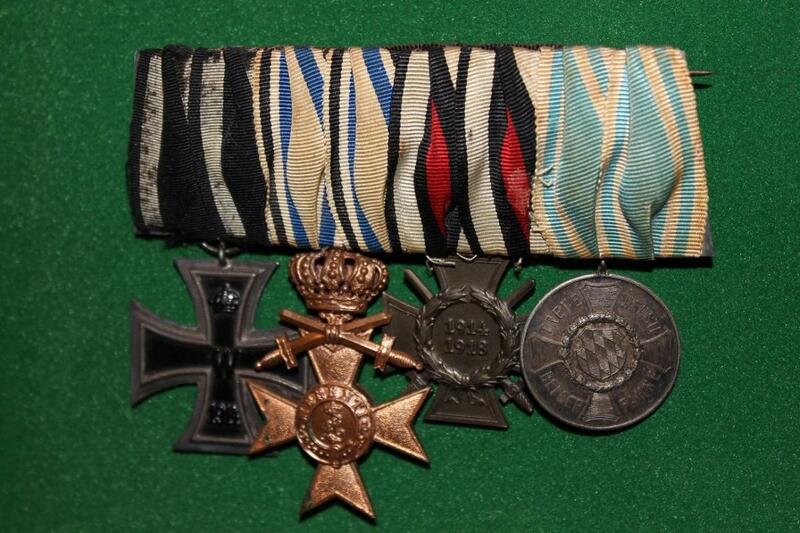 He earned his MVK3X on 17th June 1916 and his EK2 on 28th June 1917. The EK2 certificate is unusual in that it details why he was awarded it.
" Fur tapferkeit in der kampfen im Okt 1914 und der Schlacht an der Somme." What makes it special to me is the thought that a couple of weeks after being awarded his MVK3X most of his mates were gone, either dead or prisoners on the first day of the Somme. The kB RIR6 was virtually annihilated only a few hundred remained of which Konrad was one of the lucky few! Unfortunately I can't find out any more as his service history doesn't appear on Ancestry. I hope you like this poignant little group. fantastic group indeed!! He is 100% on ancestry... probably name spelled wrong. His name was Konrad Kießling, not Kißling, at least according to the Kriegsstammrolle of the 9.Komp., bay. RIR 6 and the Kriegsstammrolle of the Ersatz-Bataillon, RIR 6. He was born on 21 May 1886 in Lechhausen and was a butcher in Nuremberg in civilian life. I don't think the medal bar goes with the documents. 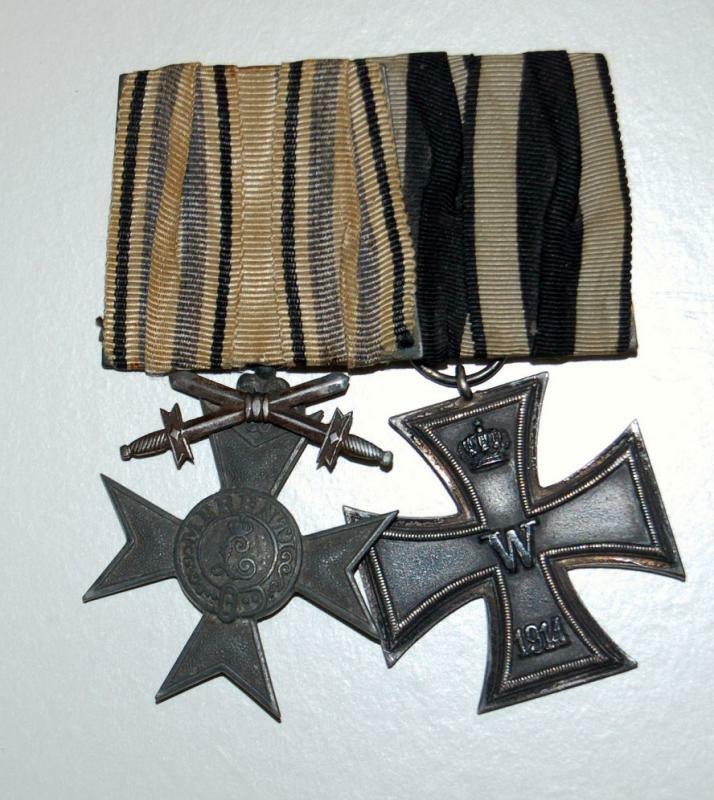 Kießling also had the Bavarian Dienstauszeichnung 3.Klasse, awarded on 12 February 1918. Kiesslings last rank was Sergeant and he was woundet in june 1918. 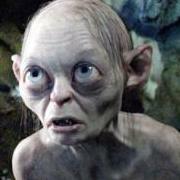 Possibly, he became later the woundbadge. Thanks guys for your input and interest. Chris you were right they indeed had spelt his name wrong on the Certificates, but I thought I had checked all the obvious options, but then again I forget more than I remember these days!! Dave thanks for the info you are indeed correct that this can't be his bar as he received a DA3 and I agree with Spolei on 28/6/1918 he was lightly wounded on his left side by a shell splinter and spent the next 4 weeks in various hospitals, so he would have got a Black Wound Badge as well. 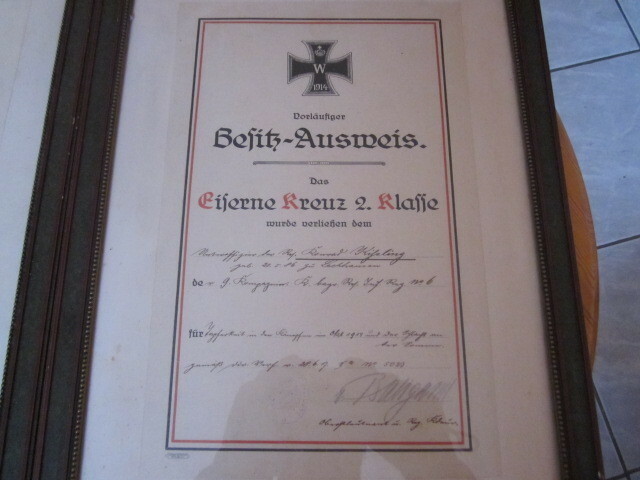 For the record he was listed as Gefreiter on the MVK3X certificate and Unteroffizier on the EK2 certificate and ended as sergeant. 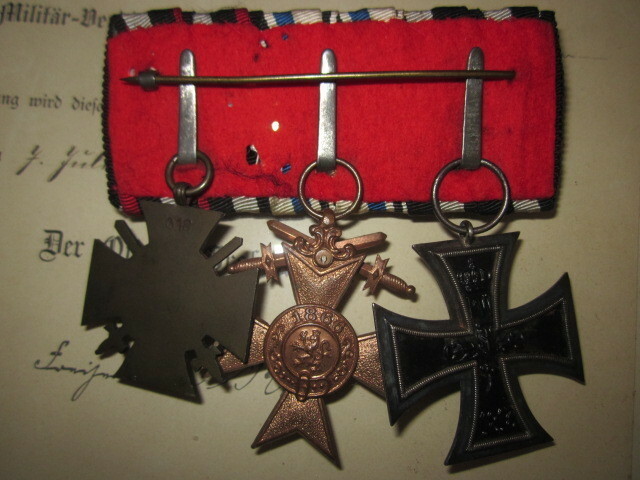 Another one from my collection this time a five medal bar for an unteroffizier with a quite unusual combination. 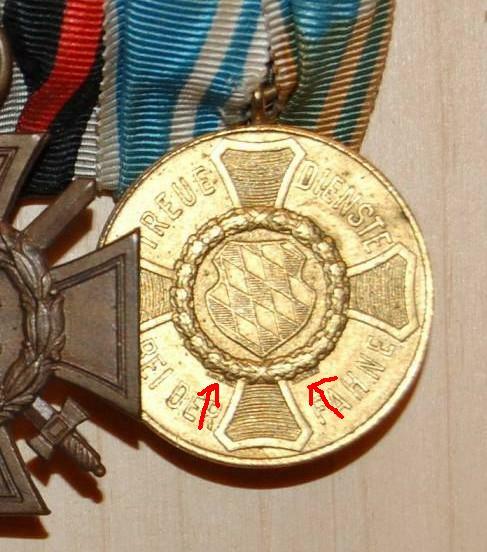 Interestingly as Spolei showed earlier this DA3 is maker marked, where he showed, "CHR Lauer Nurnberg." I don't believe the Saxe Coburg medal points to a regimental connection so this guy must presumably have been connected in some way to Saxe Coburg Gotha itself. I bought this as it was the first time I have seen a SEHO silver medal on a Bavarian NCO bar.